During his "open dialogue" with the press on 29 January, President Alexander Lukashenka continued walking the fine line between alarming Russia and progressing Belarus' relations with the West. The Belarusian ruler made it clear that he appreciated the noticeable shift in European and US policy towards Belarus, all the while reaffirming his mistrust of the West at the same time. He swore allegiance to the nation's "sacred ties" with Russia, though he also insisted that he would never "go to war with the West to oblige someone". Quite unexpectedly, Lukashenka gets the chance to have a direct top-level dialogue with the EU on 11 February when he will host a meeting on Ukraine with the participation of Angela Merkel and François Hollande. Given the format of the event, it is unclear whether he will get anything substantial out of it, apart from the obvious PR benefits. Lukashenka and his religious figurehead, Lieanid Huliaka, also managed to mar Belarus' relations with the Catholic Church by making a few ill-conceived statements in public. The foreign ministry was forced to intervene immediately in order to salvage their hard-won relations with the Holy See. Latvia is considering inviting Alexander Lukashenka to represent Belarus at the next summit of the Eastern Partnership, which will take place in Riga on 21 – 22 May. Andrejs Pildegovičs, Latvia' State Secretary for Foreign Affairs, announced their intentions on 23 January, speaking to the press in Minsk after several meetings with his Belarusian counterparts. The Latvian diplomat stressed that the final decision would rest with the Belarusian authorities. He also made it clear that Europe expected reciprocal steps from Belarus: "In today's Europe there's no such thing as political prisoners". In its relations with Belarus, the European Union is willing to go beyond the current stage of intensive working-level interaction. Reaching this stage was quite an achievement in 2014. A few years back, meetings at the level of foreign ministers and their deputies were a rarity. Now, the foreign ministry's European department works overtime to cope with the overwhelming workload of visits and consultations. However, further normalisation in their relations seems unlikely without Lukashenka's direct engagement in the process. On 29 January, Lukashenka expressed his pessimism and doubts about the prospects of normalising relations with the West: "I don't really trust our Western partners… No major shifts in relations between Europe and America and Belarus will happen until after the presidential election". The Belarusian ruler also exhibited conflicted feelings about attending the Riga summit. I'm not eager to go to this Eastern Partnership [summit]. I'm sick and tired of having these meetings the past twenty years. I know how they deal with matters there. Although I don't reject [the summit]. The Riga summit provides a convenient and comfortable setting for Lukashenka to make his European comeback – a familiar circle of his CIS counterparts joined by top EU officials. In the current geopolitical situation, the Belarusian regime needs the Eastern Partnership to counterbalance the smothering embrace of Russia. If nothing else, he could use closer ties with Europe to blackmail Russia and extract tangible economic benefits. However, the price of his ticket to Riga has a ceiling. He fears appearing soft and manageable in the eyes of his voters and Russia by making open concessions on the sensitive topic of political prisoners. Tough bargaining on the conditions of his attendance is bound to stretch on over the next several months. Speaking on Belarusian TV on 8 February, Foreign Minister Vladimir Makei stated that Belarus' participation in the Riga summit was conditioned on an invitation "on an equal footing", "without any discrimination". The outcome of the visa facilitation talks may also influence Minsk's decision. The government would enjoy having something tangible to show for Lukashenka's participation. On 30 January, Vladimir Makei received Archbishop Claudio Gugerotti, the Apostolic Nuncio to Belarus. The minister hastened to mend the rift that recent rash statements by senior officials caused in ties between Belarus and the Catholic Church. The Belarusian authorities value the relationship with the Holy See, one they have been at work on for years. 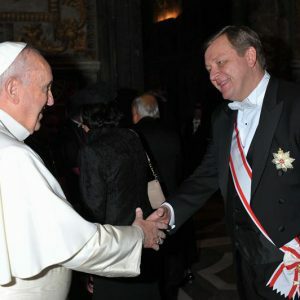 Alexander Lukashenka has often praised the Vatican's role in improving Belarus' relations with the West. A week prior, Lieanid Huliaka, the Commissioner for Religious and Ethnic Affairs, speaking at an annual meeting of his Office, accused "some Catholic priests from Poland" of meddling in politics. "They don't like our country, our laws, or our leaders". The Roman Catholic Church in Belarus has a serious shortage of locally born clergy. According to official statistics, out of 430 Catholic priests serving in Belarus, 113 are foreigners, mostly from Poland. On 29 January, President Alexander Lukashenka voiced the same concerns. At his meeting with the press he said, "As for the Polish clergy, I am not very happy with the service of some Polish representatives here… On occasion, they are doing things they should not be doing". These converging statements from top officials alarmed the Catholic Church in Belarus. On 30 January, the Conference of Catholic Bishops issued an urgent statement calling these accusations "a baseless insult to the Catholic Church and the incitement of ethnic and religious hatred". Vladimir Makei went out of his way to defuse tension created by his boss and colleague. The minister described the Holy See's position and practical activities towards Belarus as "very constructive and balanced". He conveyed the president's appreciation for Pope Francis' efforts in combating poverty and promoting peace and stability and offered to be a bridge to open up discussion of possible issues between all concerned parties. The foreign ministry would obviously hate to see its friendly ties with the Vatican crumble following a few opportunistic statements. Belarus has made an important step in institutionalising its top-priority multilateral initiative. On 20 January, the international community saw the emergence of a Group of Friends of the Family in New York, when Belarus' Deputy Foreign Minister Valentin Rybakov made a statement on its behalf at UN headquarters. It took a few weeks for Belarusian diplomacy to pull together 18 like-minded countries. As will readily be observed, Islamic nations from Asia, the Middle East and Africa dominate the group, and it does not have a single representative from the Western hemisphere or Europe (besides Belarus). It is interesting to note that a common characteristic of the group's members is their autocratic or even dictatorial domestic regimes. Speaking at the UN, Valentin Rybakov reaffirmed that the family remained the natural and fundamental unit of society and is entitled to protection by society and the state. The statement called for the systematic mainstreaming of "the family" across the post-2015 development agenda. It avoided making an explicit reference to what the definition of a family is, though still failed to gain broad support. Despite the limited support enjoyed by its pet initiative, Belarus is determined to keep it alive at all costs. As it capitalised on its highly successful initiative on combating human trafficking, Minsk wants to maintain its standing in multilateral international diplomacy. The year 2015 will herald a new presidential election in Belarus, certainly by the fall, and perhaps as early as March. It will be the fifth presidential election since the introduction of a national Constitution in 1994, and will mark Alexander Lukashenka’s 21st year in power. Traditionally, elections are times when there are opportunities for the opposition to attract public attention, to use short spans on national TV and radio, and to make appearances at public venues. On paper at least for several reasons opposition leaders appear to have greater opportunities for support than in the past. They can be listed as follows, and not necessarily in order of significance. First, as the president indicated in his meeting with journalists on 29 January, he is growing old—in fact he seems to have aged much faster physically than his equally seasoned counterparts such as Anatol Liabedzka of the United Civic Party or the still jailed Mikalai Statkevich of the Social Democrats. That fact seems to lead the president to talk about the possibility of retiring from office. Second, the country appears somewhat directionless. The president has no plan for the future, no clearly laid out scheme for economic reforms, or vision of where his state lies in the European and Eurasian geostrategic picture. The question would seem critically important in view of the events taking place in neighbouring Ukraine, which have polarised much of the continent. Third and related to the above is the increasingly gloomy economic picture brought about in part by the sharp decline of the currency and falling world oil prices. Though the president has not devalued the ruble officially, it has reached unprecedentedly low levels against the dollar and Euro. He has suggested refinancing the country’s growing debt. But the usual escape route of foreign loans from Russia, or aid from the International Monetary Fund is no longer available, forcing the president to seek new partners who are unlikely to offer very favourable terms. China at the head. Fourth, the opposition has had opportunities to learn from past mistakes. In 2001 campaigns to come up with a unified candidate took place too late to have a major impact (2001). In 2006, they were diluted by divisions that resulted in two competing candidates (Alekssandr Kazulin and Aleksandr Milinkevich in 2000). And, if one wishes to go back further, this also happened in 1994. In the 2010 campaign the plethora of candidates stymied any real possibilities of convincing the electorate that valid alternatives existed. Fifth, in 2010 at least three of the candidates made direct overtures for Russian support for their campaigns, and attained some success until a rapprochement between Lukashenka and President Dmitry Medvedev a little over a week before the vote tool place in Belarus ended these hopes. Such moves presupposed that Russia was getting weary of Lukashenka. And today the rift between President Vladimir Putin and Lukashenka seems even wider. Some Russian leaders have expressed open frustration with the apparent lack of support from Minsk for Russia’s response to Ukraine’s Euromaidan. Despite these obstacles, which might daunt a president in a more democratic environment, Lukashenka is actually more popular today than he was in 2010. The ostensible dilemmas for the incumbent president are actually beneficial in terms of his reelection—admittedly, one is not speaking here of an open election on an equal platform. At the same time they weaken his rivals, who have struggled to find viable policies on which to mount a concerted and united campaign. Let us take the five above “problems” in turn. First, Lukashenka’s age and time in office is translated in official parlance into valuable experience. Who else, he asks, could be entrusted with office at such a critical time in the state’s short history? Of course, he might step aside, but only if he is critically ill or suffering from dementia? Besides, he adds, it is even necessary to raise the pensionable age because of the fall in numbers of the working age population. Moreover, to resign at a difficult time would lead, he states, to accusations of cowardice. Therefore Lukashenka must stay and fight on. What else could be expected? Second, the directionlessness is actually advantageous. What could be more dangerous at the current time than a radical reform platform that would likely entail wage cuts, closure of unprofitable factories, and opening national industries to foreign control? Why must Belarus commit itself to the Eurasian Economic Union or European Union when it can remain on decent terms with both entities, its membership of the former merely token compliance to the wishes of Putin? Hasn’t the policy of vacillation and flip-flops worked so far? Who can tell where Lukashenka will move next? Third, the country’s economic plight can be blamed on world events and problems. It is simple to argue that they are external to Belarus. Though to some extent this attitude is partially offset by the recent firing of Prime Minister Mikhail Myasnikovich and other officials, it remains in place. Lukashenka evades responsibility. He even suggests that Belarusians themselves are to blame for the crisis by abandoning their own currency and attempting to purchase dollars, a cowardly action deserving of scorn and condemnation. Fourth, the opposition is neither united nor rejuvenated, despite repeated attempts to come up with a formula for unity. One reason for this is the thoroughness with which the state repressed opposition leaders—less directly after the 2010 presidential elections, which solicited international attention, than in 2011 and 2012 when it took extreme steps to ensure the eradication of its “enemies,” particularly among the young. Fifth, there is no Russian route available today for the opposition, a time when a state-fostered national sentiment has come to the fore. Belarusians are unclear whether in the Donbas conflict they support the Ukrainian side or the Russian, but they are much more certain when it comes to the survival of their own country. 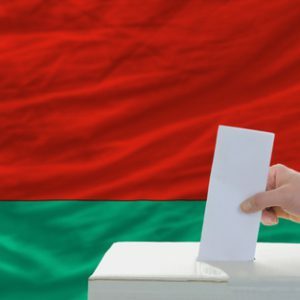 The 23 years of the Republic of Belarus have come to mean something, however national identity might be defined. And like Ukraine’s Leonid Kravchuk in 1991, to some extent, the president has purloined the opposition’s insistence on the national integrity of Belarus, albeit alongside nebulous statements about the “sacredness” of the Russian people and their “oneness” with Belarusians. 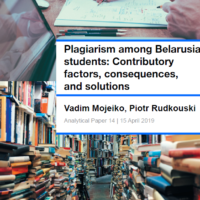 The claim that under Lukashenka, Belarus has attained a form of national integrity is false, but it has had some impact. At its height it has persuaded even some western observers to identify the nation directly with Lukashenka. It is a tunnel vision that overlooks his failings and ignores other aspects of Belarusian political and cultural life. It also conveys the image that he alone is standing, defiant, against imperialist and predatory Russia while the EU dithers. The people see what they are meant to see, however narrow and distorted that vision may be. And it is why we have not seen the last of Alexander​ Lukashenka. David is a Distinguished University Professor at the University of Alberta in Canada.